You will not talk to him about this, I am sure. I'm greatly looking forward to meeting His Eminence on Saturday at the SPUC youth conference. I think I've mentioned he was my bishop while I lived in St. Louis. Soft spoken and humble man---not afraid of controversy. Would not allow any pro-abort politicians to take Communion . Wouldn't even allow Sheryl Crowe to give a benefit concert for Cardinal Glennon Children's Hospital because of her outspoken support for abortion----boy did he catch hell for that from Catholics, the medical community and the press. But he was right! Even my agnostic husband was impressed after meeting him. I feel so blessed to have had him as my bishop and especially proud of him now. As a convert, I might be in danger of losing my faith under Pope Francis but for prelates like Burke, Cordileone, Athanasius Schneider, etc. Cuuld you discuss this with His Eminence? What was Fr. Hardons error that Cd. Burke approved? Just trying to keep up. Fr.John Hardon's error was that he made an irrational inference. He assumed that being saved in invincible ignorance or with implicit desire referred to personally known, nameable cases in the present times.This was a false inference.This then became a false premise for him. Since he concluded that these cases of persons saved, this category of people, now in Heaven, were explicit exceptions to all needing the baptism of water, in the present times.They were exceptions to all needing to enter the Catholic Church for salvation. So based on the wrong premise, he wrongly concluded that every one did not defacto, in the present times, need to enter the Church for salvation. He used an irrational premise ( the dead-saved are visible on earth) which resulted in an irrational conclusion ( everyone does not have to defacto enter the Church). Since he assumed that salvation in Heaven is explicit for us, those saved with the baptism of desire and in invincible ignorance, became exceptions to the dogma extra ecclesiam nulla salus. So for him every one did not have to become a formal member of the Church, but only they had to, who were not in invinciblle ignorance.While those who knew about Jesus and the Church and yet did not enter were on the way to Hell.So he changed the original teaching which said all with Original Sin need the baptism of water. This was the original mistake made by the Holy Office and the Archdiocese of Boston in 1949 when they assumed that a category of people now in Heaven were objective exceptions on earth to the strict interpretation of the dogma extra ecclesiam nulla salus. Fr.Hardon wrote an article on outside the Church there is no salvation in which he repeated this mistake.Also as a consultant to the Holy See on the Catechism of the Catholic Church he let this error pass conspicuously in CCC 1257 (The Necessity of Baptism) and with confusion in CCC 846 (Outside the Church No Salvation). Cardinal Raymond Burke approved this article by Fr.Hardon. Cardinal Buke also recommends the Catechism of the Catholic Church which incorporates this confusion while he has never affirmed the traditional strict interpretation of extra ecclesiam nulla salus. This is also observed in Cardinal Raymond Burke's criticism of Vatican Council II. Salvation in Heaven is an explicit exception to the traditional interpretation of the dogma. So LG 16,LG 8, UR 3, NA 2 etc refer to visible in the flesh cases in 2015. 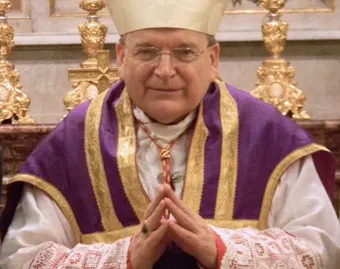 Vatican Council II contradicts the dogma extra ecclesiam nulla salus and the Syllabus of Errors for Cardinal Raymond Leo Burke. It is a break with the traditional teaching on other religions and Christian communities.This was also Fr.John Hardon's mistake. This a private note to Seattle Kim. Hi I lived in seattle in the 60s. I knew a lady called Helen Gervais. Have you heard of her? Salvation by baptism other than water or martyrdom for the True Faith is theoretical as one can never be certain that the criteria were actually satisfied in a given case. @Catholic Mission: Interesting. To teach a 'dogma' of exceptions from dogma, is a bit mad. I never knew Fr Hardon taught 'this'. A bit confused about how 'Feenyism' can be used as an example. The Church's doctrine on baptism of blood and invincible ignorance were what Feeny was trying to run-over with his personal dogma on salavation. At any rate, Bergoglio's usurpation of the satanic beheading of people by muslims because they were deemed to be Christians is an appalling piece of political usury. To Paul--looks like their is a Helen Gervais who is president of the Seattle Children's Hospital Guild Association. Might this be her? I don't work at the hospital---I work in home care. Agreed Lynda.We cannot know if that person also received the baptism of water. Interesting. To teach a 'dogma' of exceptions from dogma, is a bit mad. Exactly the dogma did not mention any exceptions. I never knew Fr Hardon taught 'this'. For Fr.John Hardon the baptism of desire and being saved in invincible ignorance were exceptions to the strict interpretatiion of the dogma. He affirms this in an article which can be read on line. He also over looked this error in the Catechism of the Catholic Church (1257).He was a consultant on the Catechism. A bit confused about how 'Feenyism' can be used as an example. Feeneyism affirms the strict interpretation of the dogma.There are no explicit exceptions. So if LG 16, LG 8, UR 3, NA 2 are not explciit for us in 2015 ( and they are not) then there is nothing in Vatican Council II to contradict Feeneyism. The Church's doctrine on baptism of blood and invincible ignorance were what Feeny was trying to run-over with his personal dogma on salvation. Another is that Fr.Feeney was saying there is no salvation outside the Church. While Cardinals Marchetti and Cushing were saying there is salvation outside the Church. We now know that Fr.Feeney was correct. 1.Since the cardinals in 1949 did not personally know of any person saved outside the Church i.e without 'faith and baptism'(AG 7). 2) Also no magisterial document before 1949 stated that there were explicit exceptions to the traditional interpretation of the dogma.They only mention the being saved in invincible ignorance etc and this could include the baptism of water. So there was no magisterial precedent for the cardinals who gave us a new doctrine and rejected the dogma with an inter office letter from the Holy Office in 1949. At any rate, Bergoglio's usurpation of the satanic beheading of people by muslims because they were deemed to be Christians is an appalling piece of political usury. Without the premise from 1949, without the irrational inference, without the 'explicit exceptions, Vatican Council II is saying in Ad Gentes 7 that all Muslims need to formally convert into the Catholic Church to avoid Hell. There are also no exceptions to the dogma in Vatican Council II.